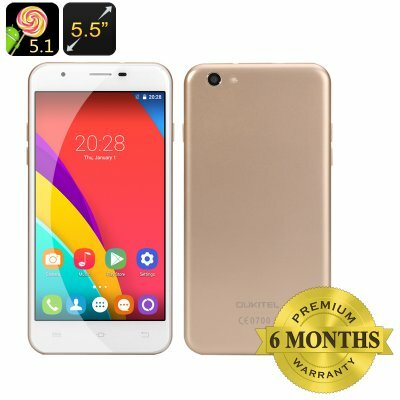 Successfully Added OUKITEL U7 Pro Smartphone - 5.5 Inch 2.5D IPS Screen, Quad Core CPU, Android 5.1, Dual SIM, HotKnot (Gold) to your Shopping Cart. OUKITEL have launched a number of phones this past year and have a reputation for delving great value for money. The OUKITEL U7 Pro is no exception to this. It offers a 5.5 inch display, Quad Core CPU, Android 5.1, Hot Knot, Smart Wake and Gesture Sensing all for under $70 makes the OUKITEL U7 Pro a must see for any entry level phone lovers. With a 5.5 inch high definition screen you can enjoy all your content in greater detail so movies and games will be displayed beautifully and thanks to the IPS features can be viewed from wide angles without any detrimental loss of detail, great for sharing the fun with others. Drawing is performance from a Quad Core MTK6580 CPU, Mali 400 MP GPU and 1GB of RAM bring a reliable performance that can handle games, movies and multitasking with ease. You can enjoy 8GB of onboard storage, which is easy to extend via the micro SD card slot. When it comes to interacting with the OKUTEL U7 Pro Smartphone the Android 5.1 OS brings plenty of functionality but it's the smart wake and Gesture Sensing that will truly amaze you. Simple draw a letter on the locked screen to open you favorite apps or wave your hand to skip music tracks and scroll though the photo gallery.